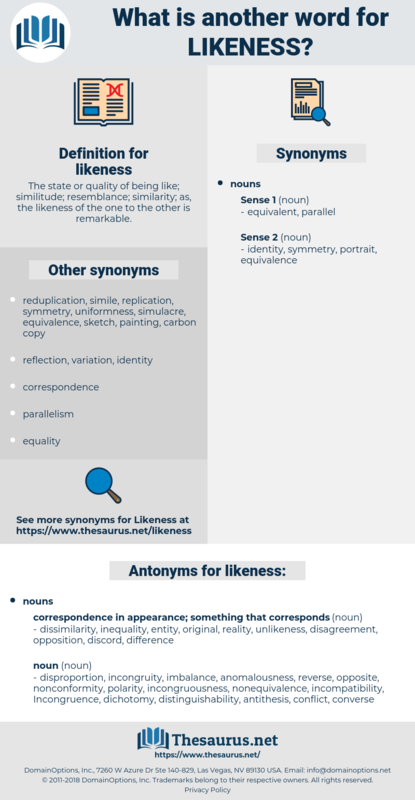 What is another word for likeness? 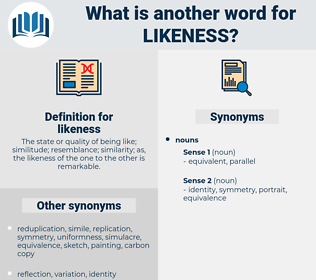 The state or quality of being like; similitude; resemblance; similarity; as, the likeness of the one to the other is remarkable. resemblance, image, portrait, picture, portrayal. dissimilarity, inequality, entity, original, reality, unlikeness, disagreement, opposition, discord, difference. disproportion, incongruity, imbalance, anomalousness, reverse, opposite, nonconformity, polarity, incongruousness, nonequivalence, incompatibility, Incongruence, dichotomy, distinguishability, antithesis, conflict, converse. But now let me call your attention to another field of inquiry, in our search for evidence to establish a likeness between the earth and the other parts of the universe. Is it a good likeness? logomach, lysogenize, laxness, legging, licencee, lousiness, laughing gas, locking, lychnis, leishmaniosis, lashings, likening, lashing, looking, licence, licking, lichenes, lessening, laconic, Luckiness, leaching, Lake Onega, license, loosening, leucogenes, ligneous, lagging, lacking, losings, loganiaceae, lozenge, lawlessness, logginess, lacewing, lysogenic, lake seneca, lissomeness, lacing, luging, laughing jackass, lysimachia, like kings, leguminosae, laziness, lysimachus, laughing, loquaciousness, leguminious, logging, Logomachy, lushness, Leakiness, licensee, looseness, loch ness, lessing, liking, lusciousness, loginess, lysenko, lignosae, leishmaniasis, lake nyasa, leguminous. identikit picture, portrayal, portrait, identikit.